Tara Santelices | Here's to Life! By now, many of you have heard of, read about, or even blogged about Tara Santelices, the girl who was shot in the head during a jeepney holdup. I have been remiss in posting this but I hope to make up now because friends and family of Tara are putting up a concert for this brave young lady. The latest news I gathered from the blog of my friend Cathy is that Tara is now able to open her right eye and yawn. Baby miracles give us hope that one day we may witness THE BIG ONE for Tara. All these are by God’s grace and in His time. 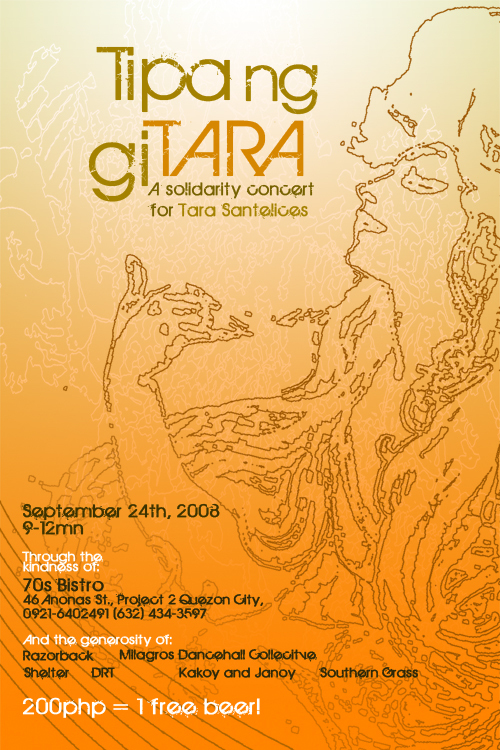 Meanwhile, you can do your bit for Tara by supporting the concert.